The answer… Synergy – the compelling reason why television advertising is as relevant as ever. For the last two decades it has been fashionable to prognosticate the death of television advertising whether delivered by broadcast, cable, satellite, or stream. The general storyline has been that emerging digital channels will displace television advertising through a combination of lower costs per exposure and better ability to target specific audiences both demographically and by exhibited category interest. But while digital advertising has seen explosive growth it has not yet toppled television from the top of the media spend hill. 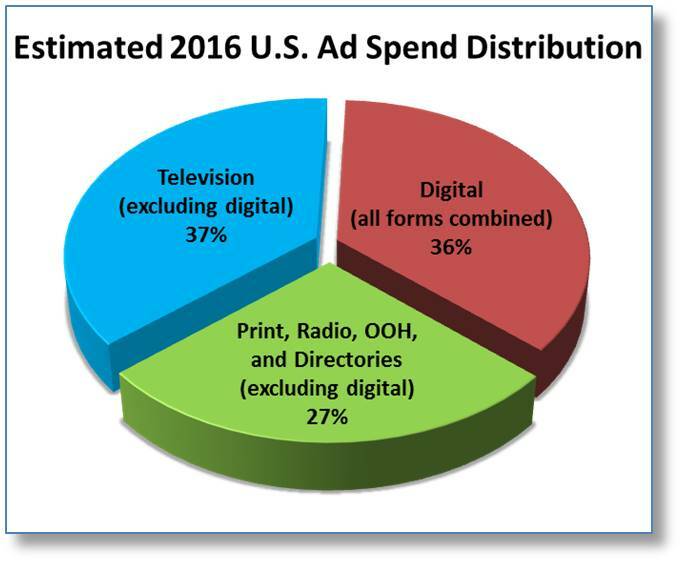 Television still maintains a one percent edge over digital with 2016 U.S. ad spending for traditional, non-digital television projected to be $70.6 billion versus combined digital at $68.8 billion. Given the above cited advantages of digital how can this be? Part of the answer lies in the richness of the television exposure. Television provides a ‘lean back’ experience that combines smooth full motion video with high quality sound. The typical digital display ‘lean forward’ experience with smaller screens and less dynamic speakers doesn’t provide the same level of emergence. Another part is the interruptive nature of television advertising which occurs in stream with the programming and seamlessly takes over the whole experience. In many digital forms the advertising exposure occurs simultaneously with the content, effectively having to compete for attention with that content. And digital also has a significant viewability problem with served ads appearing off-screen, being blocked, or viewed by non-human bots. According to the latest comScore benchmark study in the U.S., only 48% of desktop display and 41% of desktop video are non-fraud, viewable impressions. And this is not confined to the U.S.; according to comScore similar rates are occurring worldwide as shown in their infographic. 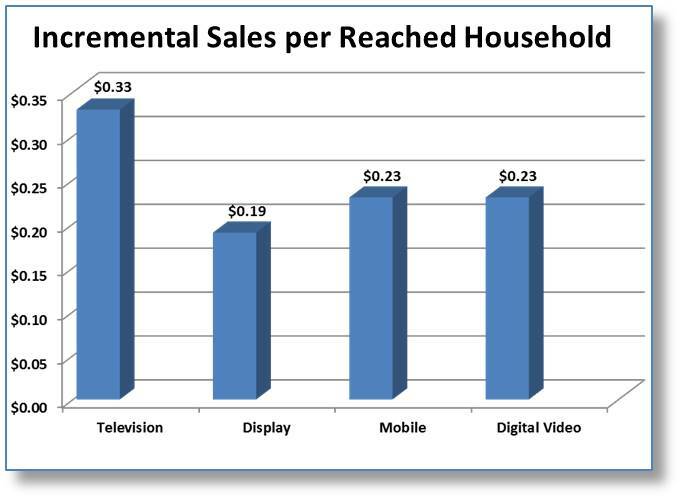 In aggregate this means that television still typically delivers the highest sales return on a per reach basis. 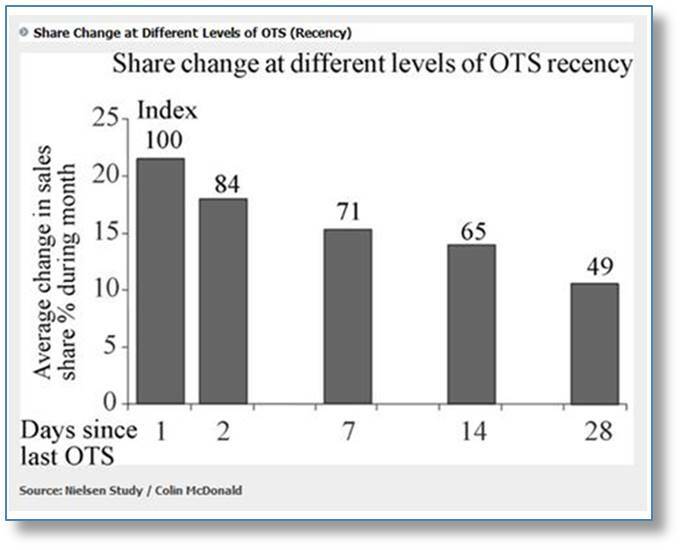 A recent single-source meta-analysis by Nielsen Catalina Solutions dramatically illustrates this point. Spanning fourteen hundred campaigns conducted by four hundred fifty CPG brands over eleven years, the analysis calculated incremental sales per household reached. Compared to three common digital formats, television campaigns returned approximately 40% more incremental sales per reached household. However, when looked at on a per-cost basis the results are much closer. Essentially the lower cost for digital (except for digital video) and its ability to better target brings it into parity with television on average. But this should not be interpreted to mean that spend can be moved from one channel to another without implications. One thing we know for certain is that media channels are not an “either this or that” proposition. In fact, confining advertising to just one channel can have a substantial, negative impact on advertising returns. A new quantification of this synergy was included in the How Advertising Works study sponsored by the Advertising Research Foundation. A meta-analysis of 3,200 campaigns whose sales impact was modeled by Analytic Partners showed a substantial increase in incremental return-on-investment for campaigns using more than one platform. The additional lift over the single platform ROI ranged from +19% for campaigns using two up to +35% for campaigns using five. Especially synergistic was the combination of TV and digital. 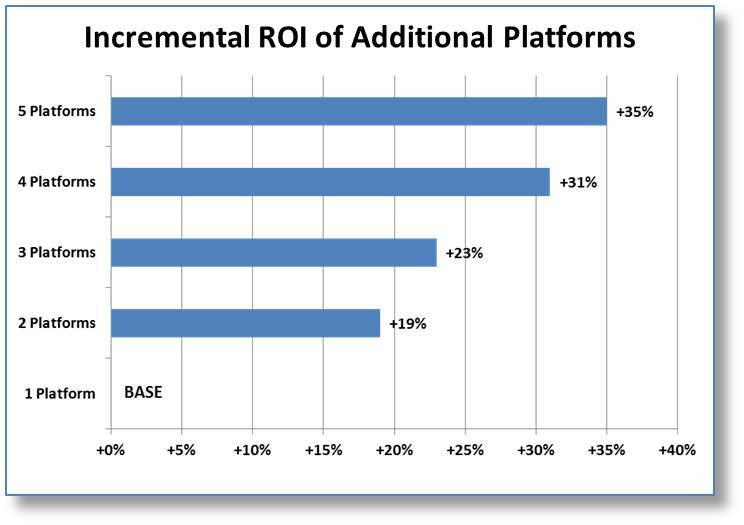 When digital was layered with TV the average increase in ROI was +60%! But this just begs the questions: From where does this synergy arise? and Why is TV advertising so synergistic with other forms of advertising? Surprisingly, four distinct sources of synergy have been identified and all are in play for television advertising. 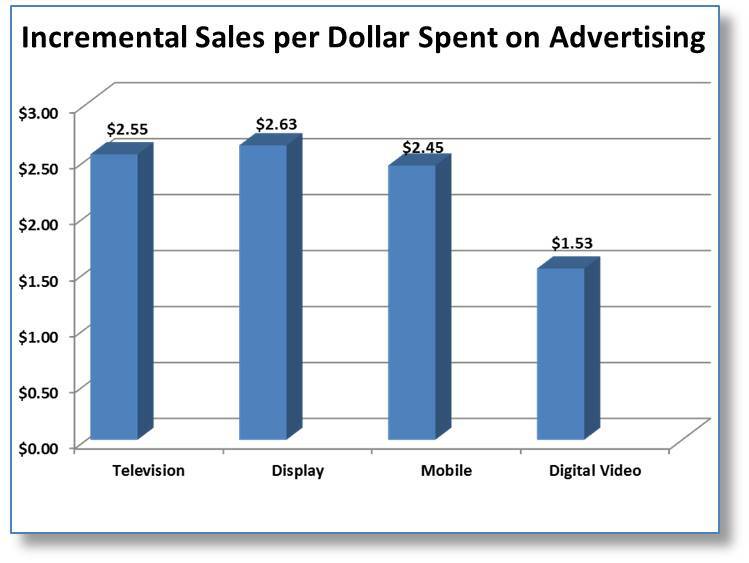 As media spend is placed behind an ad its ability to generate sales diminishes. This wearout has been proven to occur at an individual execution level. Within a single media channel this is typically managed by identifying the strongest ad from the available pool (via pretesting) and then refreshing it with new versions after it has worn out. In this way media dollars are not wasted by being placed behind ineffective ads. 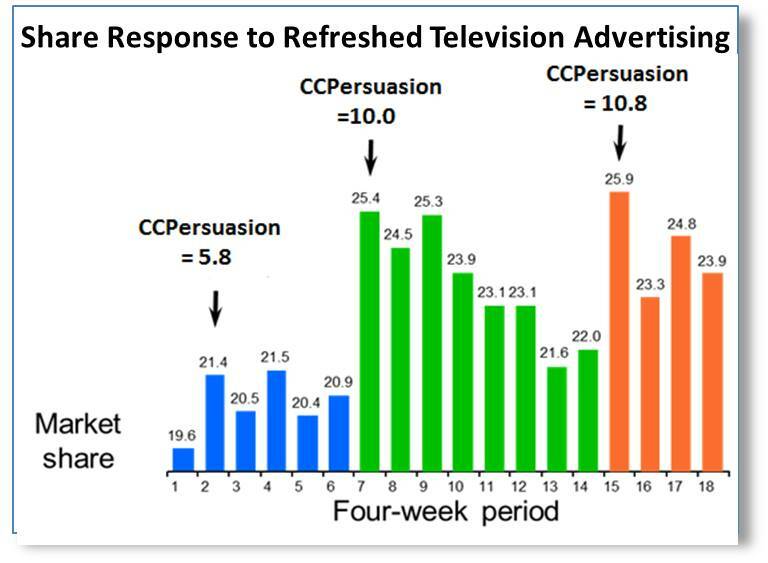 The below example shows how this refreshment approach can be successfully used to drive share higher and higher within one channel, in this case television. This effect is inherently built into cross-media campaigns. Because different platforms typically use a different ad format there is a natural tendency for this diversity to minimize wearout. There are, however, two caveats to this. First is that television and online video need to be managed collectively if the same executions are used. The second, less obvious issue is that highly targeted campaigns can increase wearout by concentrating spend on a smaller number of consumers. For example, a brand which heavy ups on digital may find itself over saturating a specific target at the expense of reach among a broader audience. 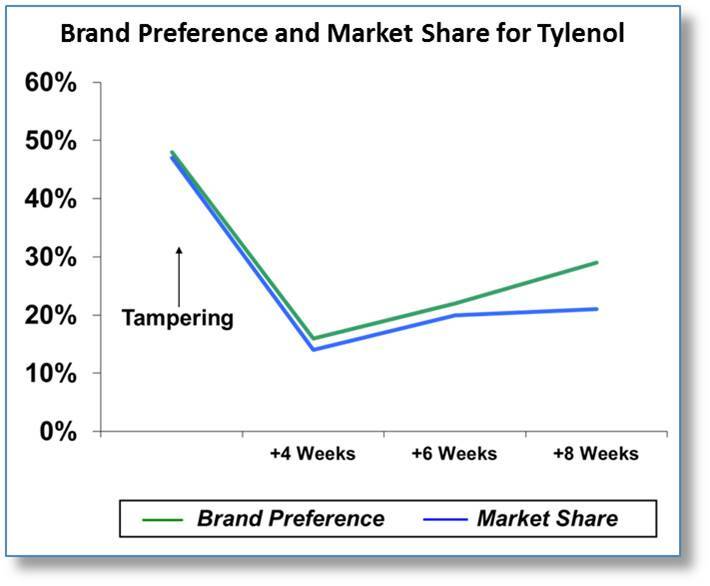 As cited in a recent Wall Street Journal article, the Procter and Gamble company recently faced this issue and will now “move away from ads on Facebook that target specific consumers, concluding that the practice has limited effectiveness.” As explained by P&G CMO Marc Pritchard: “We targeted too much, and we went too narrow, and now we’re looking at: What is the best way to get the most reach but also the right precision?” This reportedly includes ramping up spending on multiple digital sites and traditional media channels. Another dimension of media plan effectiveness is recency – the time between exposure to advertising and the shopping occasion. While numerous single-source studies have verified this effect, the classic examination of Nielsen data by Colin McDonald perhaps still best illustrates it. In it the impact of advertising on share was shown to steadily decline as the time following potential ad exposure increased. This includes a drop of 16% from the first day following exposure to the second day. This decline can be partially explained by a rapid decay in advertising memories. 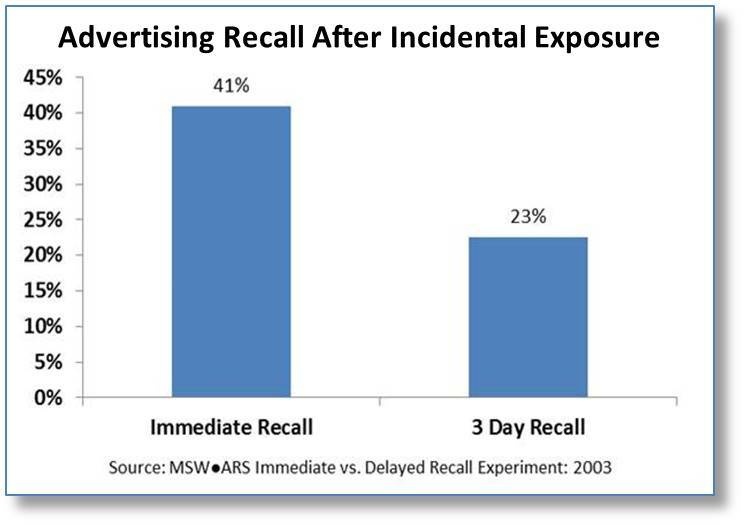 An MSW●ARS study showed that proven ad recall after incidental advertising exposure faded by nearly fifty percent in the first three days after exposure. Since each channel exhibits a different pattern of engagement time in terms of both days and hours, the use of multiple channels can increase the probability of reaching the consumer close to a buying period. 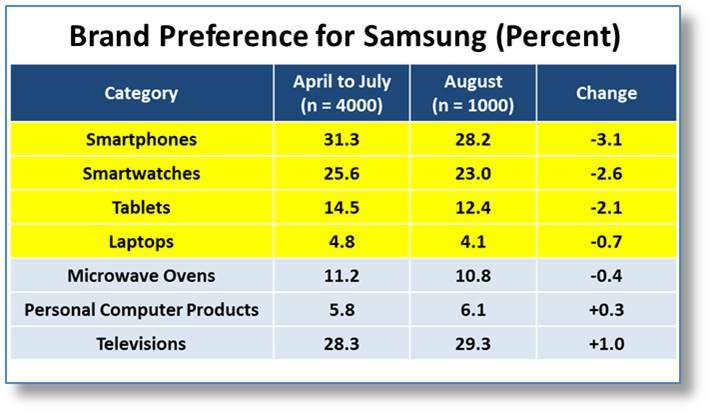 In particular, prime-time television viewing coincides with peak online shopping times for many categories. And even more compelling, online brand search volume has been directly linked to television exposure. In fact, in one attribution analysis conducted by MSW•ARS eighty-two percent of one brand’s online search conversions were first set in motion from a television exposure. This is the primary reason some brands have experienced substantial, unexpected drop-offs in search ROI when television spending is reduced; their attribution models did not take into account that television advertising was driving substantial portions of their search activity. Television advertising has been proven to be especially sensitive to these types of priming effects. The more familiar people are with a brand, the more attentive they are to television advertising. Even prior product use leads to greater attentiveness to, and recall of, the advertising. 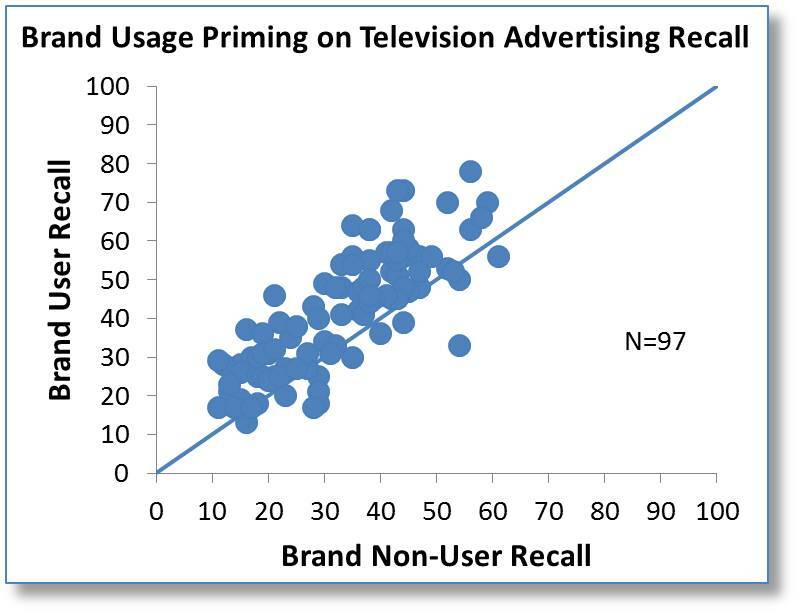 Illustrating this point the below graph compares proven brand recall levels of brand users and non-brand users for ninety-seven television ads. Across the ads, on average forty-two percent of non-brand users recalled both the ad and featured brand. 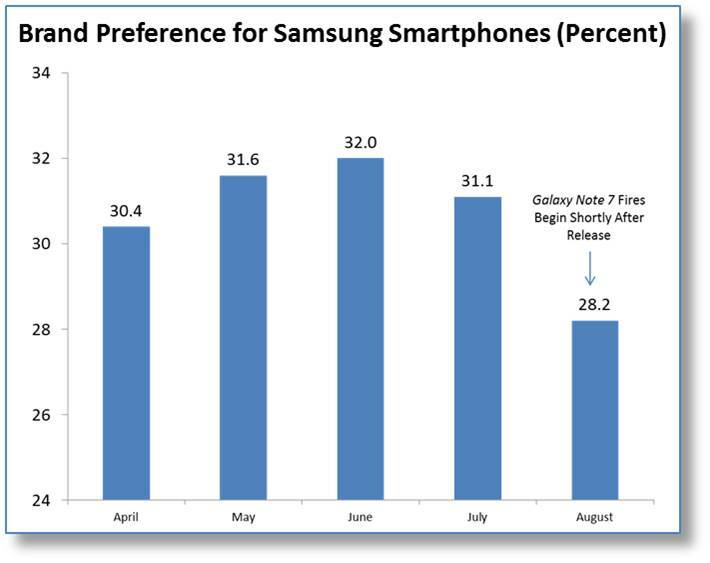 The corresponding number for brand users was fifty-one percent. Given this sensitivity to priming and its ability to reach broad audiences, television plays an especially important role in the retention of existing customers. Laying down a consistent brand dialogue via television facilitates all other media channels in effectively contributing to this retention. One of the most interesting forms of synergies arises from the internalization of brand messaging across multiple advertising exposures. When consumers become exposed to the first ad of a new campaign they tend to take away specific “lower level” messages. But as the consumer is exposed to new ad executions they tend to generalize to “higher level” messages. As an example, the below blinded “green” campaign included three ads each focused on an environmental initiative; ‘Waste Reduction’, ‘Energy Efficiency’, and ‘Reduction in Emissions’. 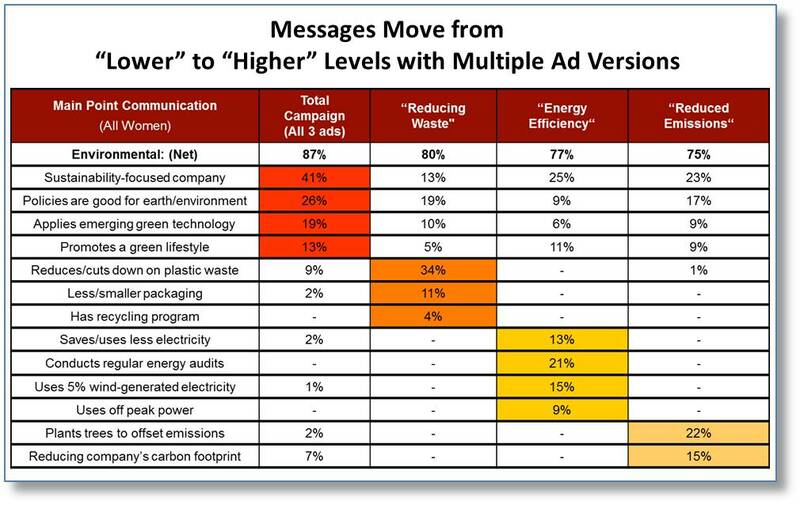 Viewers of individual ads primarily took away only messaging related to the specific environmental initiative whereas those exposed to the entire campaign took away broader message of a “sustainability-focused company”. This “ratcheting” of messaging can be used to great effect in conveying difficult and vague concepts or in tying the brand to aspirational sentiments. But it requires that consumers be exposed to multiple, effective ad versions. One of the most cost effective ways to do this is to use television’s reach to introduce the campaign and then use other, less expensive channels to activate the message synergy. The net of this discussion is that while television advertising is effective on its own, its synergies with other media channels make it a sine qua non – an essential tool for brand building. For this reason the future of television looks as bright as ever. Please contact your MSW●ARS representative to learn more about how our cross-media suite of tools can help your brand grow.